If you’re considering new windows, what you gain in improved home comfort and energy savings far surpasses the low-cost investment you’ll make to select Milgard SunCoatMAX™ low-e insulating glass. Milgard SunCoatMAX™ low-e insulating glass just plain works harder! When summertime temperatures soar, you need relief. Wintertime blues? No longer do you have to suffer winter’s discomfort inside your home. Summer-time relief used to mean cranking up the air conditioning. Our solution? Milgard SunCoatMAX™ low-e insulating glass. 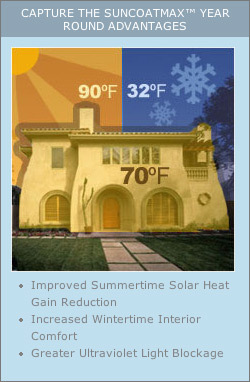 A marvelous solution to reject the sun’s heat and damaging rays, while keeping your home cooler and more comfortable. The SunCoatMAX™ low-e coating provides the best clarity and highest performance for all solar gain low-e glass products. Gain tinted glass shading benefits without having to sacrifice natural light flowing into your home! *Used as one pane in a double-pane glass unit. Milgard SunCoatMAX™ reduces the solar heat gain 62.5% over ordinary single-coat low-e glass—a clear choice to improve home comfort when the sun’s beating down on your home. During winter’s fury, the use of Milgard SunCoatMAX™ increases the glass surface temperature at the center of each window in your home. This is important for your winter-time comfort. In fact, the ‘Efficient Windows Collaborative’ (www.efficientwindows.org) suggests that when glass surface temperatures fall below 52°F, there is risk of thermal discomfort. Ordinarily, 75% of a window’s exposed surface is glass, and the interior glass temperature affects your room’s air temperature. Our SunCoatMAX™ provides a substantial 19.7% center-of-glass temperature gain over clear glass double-pane glass with 20° Fahrenheit outside temperature (an even better 32.7% improvement gain at -20° Fahrenheit outside)—a clear choice to improve home comfort when you’re in the middle of winter’s wrath. The use of argon gas in a SunCoatMAX™ glass unit could improve your thermal performance even further—consult with your Milgard representative. SunCoatMAX is a trademark of Milgard Manufacturing, Inc.
Loî©˜ is a registered trademark of Cardinal Glass Industries, Inc.
Milgard Windows is proud to be an Energy Star® Partner. That means our products provide such exceptional energy saving qualities that it has been recognized by Energy Star®. The fact is, our windows frequently exceed Federal Department of Energy standards.